Snow Goose, adult, braking to land, Bosque del Apache NWR, San Antonio, NW. This image was created on the morning of 11/18/2011 with the tripod-mounted Canon 800mm f/5.6L IS lens and the EOS-1D Mark IV. ISO 400. Evaluative metering +2/3 stop off the low blue sky: 1/1250 sec. at f/6.3 set manually. Despite the dire forecasts, conditions at Bosque at this moment are quite good. The four images included here were made on the mornings of Novemeber 18 and 19th. 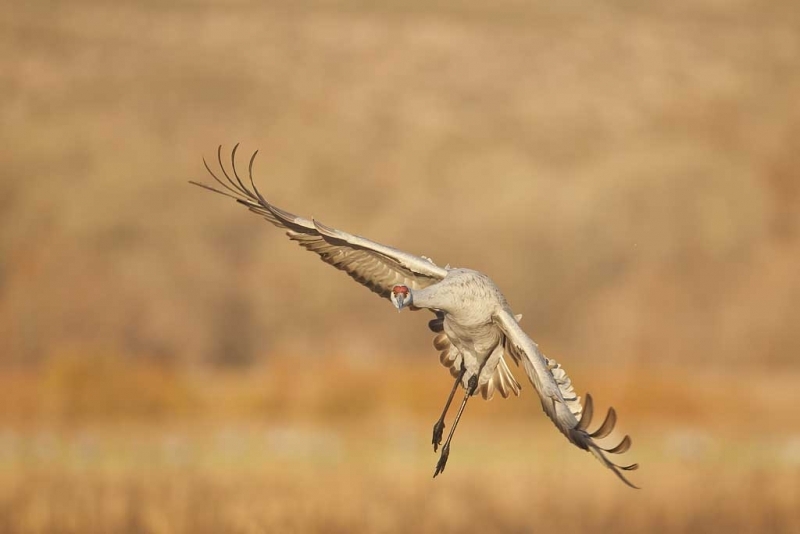 A short but detailed report entitled “Bosque del Apache Site Guide Current Conditions Update 11/18/2011” will be sent to all those on the Site Guide purchasers list on Monday, 11/21. If you have previously purchased the Bosque Site Guide and do not receive your copy by 5pm eastern time on Monday, please e-mail Jim and request the Bosque Currents Conditions Update; do let Jim know how you purchased your guide. To learn more about the Bosque Site Guide click here and scroll down. 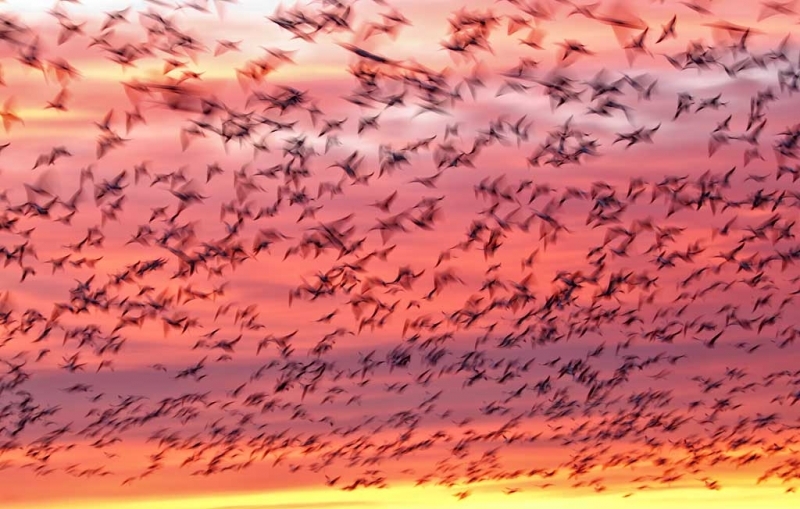 Snow Geese sunrise blast-off blur, Bosque del Apache NWR, San Antonio, NW. This image was created on the morning of 11/19/2011 with the Canon 70-200mm f/2.8L IS II lens, the 1.4X III TC (handheld at 98mm) with the Canon EOS-1D Mark IV. ISO 320. Evaluative metering +1 2/3 stops: 1/15 sec. at f/4 in Tv Mode. Central Sensor/AI Servo Rear Focus active at the moment of exposure. Click here if you missed the Rear Focus Tutorial. Lens/TC/camera body Micro-adjustment: -8. Central Sensor/Rear Focus/AI Servo AF active at the moment of exposure. To enjoy viewing a larger sized image, click on the photo. Then click on the enlarged version to close it. The IPT began this morning and got off to a glorious start with a killer sunrise. The mega blast-off above occurred after the color had begun to fade. I thought that I had dialed in +1 stop of exposure compensation but got lucky and was able to recover the brightest parts of the sky during ACR conversion as detailed in Digital Basics. As with nearly all of my recent images this one was improved dramatically by applying Tonal Contrast from NIK’s Color Efex Pro 4.1 plug-in. Please remember that you can save 15% on all NIK products by clicking here and entering BAA in the Promo Code box at check-out. Then hit Apply to see your savings. If you doubt me (could that be possible :)? ), you can download a trial copy that will work for 15 days and allow you to create full sized images. Bet you can’t eat just one! Sandhill Crane, adult wheeling in flight, Bosque del Apache NWR, San Antonio, NW. This image was created on the morning of 11/18/2011 with the tripod-mounted Canon 800mm f/5.6L IS lens and the EOS-1D Mark IV. ISO 400. Evaluative metering +1/3 stop off the grasses: 1/1000 sec. at f/6.3 set manually. Above I was able to keep the central sensor on the bird’s face as it turned unexpectedly in flight. The next frame was pretty good too. 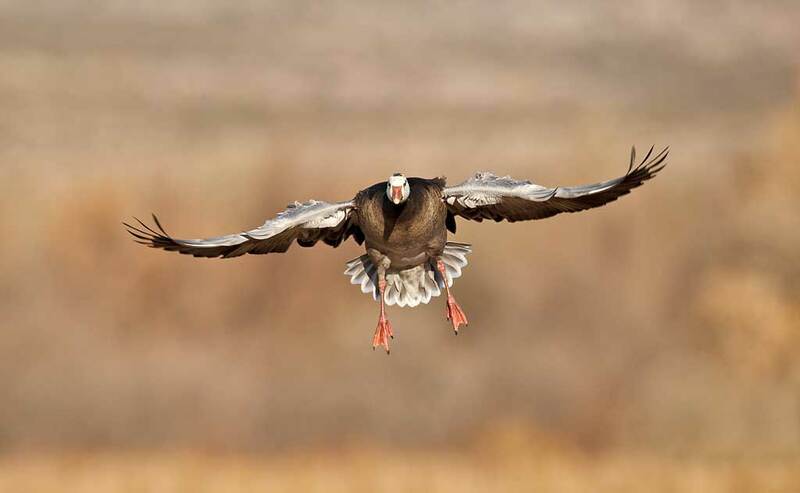 Blue Goose adult incoming wide body, Bosque del Apache NWR, San Antonio, NW. This image was created on the morning of 11/18/2011 with the tripod-mounted Canon 800mm f/5.6L IS lens and the EOS-1D Mark IV. ISO 400. Evaluative metering +1/3 stop off the low blue sky in full sun: 1/1600 sec. at f/8 set manually. 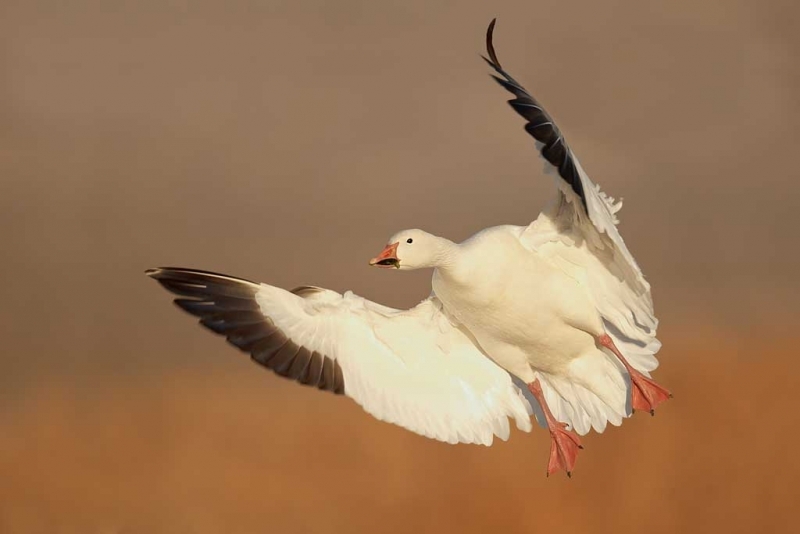 Blue Geese are dark morph Snow Geese; they come in an infinite variety of patterns. Take a moment to leave a comment and let us know which of the four Bosque images here is your favorite, and why. It’s OK if you love all four of them equally :). Like the blurred image, great composition and color with great action. Art you are the best! Hi Artie, Your photography is stunning as always. I particularly favor the Sandhill Crane image in this series. Though it doesn’t offer an in your face closeup, it does emphasize the immense challenge of bird photography. The stare down is a bonus. I’m intrigued with your choice of your ISO setting at 400 when you might choose much higher with your camera’s capability to allow using f/8 or greater consistently as insurance for near guaranteed (in your case) focus. My take on these pictures and not to offend anyone but I am finding that all Images are way over exposed…! Not just a little either. They would benefit from some contrast. They might be sharp but the exposure is killing them. I am trying to shoot a little bit brighter myself and find that white birds are always a problem. I definitely like the 1st one best…it is so sharp…and so close…and so perfect in showing a bird in flight. I like #3 (crane wheeling in flight)–very unusual position and wonderfully muted tones. It could be cropped a bit from the top, and possibly made a bit darker overall. Great to hear that conditions are more or less OK–good friends are there, and we had warned them not necessarily to expect too much. First one for me. Great light, great color and tone of background, and great pose. Hope to get some similar chances the next couple of days as Robin and I will be there Monday afternoon for a couple of days. I am sure we will come across your caravan of big lenses! Looking forward to Bosque and seeing you. Last one. Wow! Gear and flaps down, slight bank and rudder (tail) adjustment for crosswind. Bet he made the first turnoff. I like the first one. That’s always been one of my favorite flight poses. I love the feather detail of the inside of the wings. It’s Sunday morning here in Maine and i am half way through my first wake up cuppa coffee waiting for it to get light. What joy these photos brought to an old guys heart that will not see many birds till spring! Thank you they are wonderful! I can’t decide between the first and last ones. I like the first one for full view of the underside. I like the last one because of it’s perfect symmetry. I am not fond blurs as in the second one. The third one has some charm with the awkward looking kink in the neck. Good work. Glad to hear that Bosque is doing well. I plan to be there the week following Thanksgiving. All of your images are good, but are outclassed by some of your outstanding images from previous years. I think that the Sandhill’s head gets a bit lost with the wing right behind it, but the turn tells us something about the bird’s flight characteristics.